About the Hike: Once a sanctuary for Takelma Indians, today these cliff-edged mesas near Medford are a haven for hikers and endangered wildflowers. Views from the cliffs extend across the Rogue River to the Siskiyous and the Cascades. Visit in spring to catch the best flower displays and to avoid summer's merciless heat. Dogs, horses, fires and flower picking are banned on both Table Rocks trails. Difficulty: The hike to Upper Table Rock is an easy 2.8-mile trip, gaining 720 feet. The hike up Lower Table Rock is a moderate 5.4-mile trip, gaining 780 feet. Getting There: To find the Upper Table Rock trailhead from Interstate 5 take Central Point exit 33 (just north of Medford), drive east on Biddle Road 1 mile, turn left on Table Rock Road for 5.2 miles to a curve, and turn right on Modoc Road for 1.5 miles to the trailhead parking lot on the left, just opposite an electric substation. To find the Lower Table Rock trailhead from here, get back in your car, return 1.5 miles to Table Rock Road, turn right (away from Medford) to milepost 10, and then turn left on Wheeler Road 0.8 mile. Hiking Tips: Each of the two Table Rock mesas has its own trail, but the path to Upper Table Rock is shorter and slightly easier. The Upper Table Rock Trail climbs through a scrub oak grassland ablaze with spring wildflowers. In April expect blue camas and pink fawn lilies. In May look for pink, 4-petaled clarkias (alias "Farewell to Spring"), California blue-eyed grass (with six small petals), and Elegant Brodiaea (with six long purple petals). By June, orange paintbrush and tall purple ookow are blooming, too. In all seasons, beware of triple-leafleted poison oak. At the 1.1-mile mark, after a final steep pitch, the trail suddenly emerges onto the table's amazingly flat, grassy summit. In 200 yards the path crosses an old road. Here you can either turn left along the road to a viewpoint at the table's southern tip or continue straight without a trail to a dramatic viewpoint west-both good destinations before heading back to your car. The trail to Lower Table Rock, though longer and rockier, climbs through shadier woods and leads to a viewpoint atop a taller cliff. 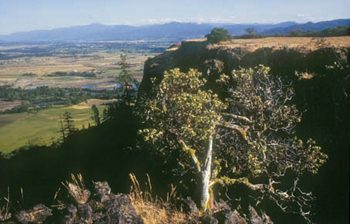 Most of Lower Table Rock was dedicated as a nature preserve in 1979 by The Nature Conservancy, the public-spirited non-profit organization that built the trail. The trail sets off along a fenceline through grasslands with the same profusion of flowers as at the other mesa. Listen for the musical warble of redwing blackbirds and the squawks of ring-necked pheasants. The path climbs, steeply at times, through a dry forest of madrone and black oak. After 1.6 miles the path suddenly crests at the plateau and becomes an old road. The quickest route to a viewpoint is to walk the road 200 yards and fork left on a trail that deadends in 0.3 mile at a 200-foot cliff. From here you can see your car far below. The snowy rim of Crater Lake rises above Upper Table Rock. The Rogue River, like a great green snake, curves across a quilt of orchards, ranches and gravel pit ponds toward the distant white cone of Mt. McLoughlin. Turkey vultures soar on updrafts. For the best view of all, however, hike back to the road and follow it a mile across the mesa. The road becomes an old grassy airstrip bordered by vernal pools - ponds that dry up by May, leaving a haze of flowers. Look here for dwarf meadowfoam, a subspecies that exists only on the Table Rocks. At the airstrip's end, continue right on a path to a viewpoint overtowering the Rogue River. History: An 1850 gold strike at Jacksonville attracted so many miners and settlers to the Rogue Valley that the local Takelma Indians launched an attack in 1853 to reclaim their homeland. When the U.S. Army retaliated, the Takelmas retreated to Upper Table Rock, a natural fortress that defied capture. The Army sent a peace negotiator, Joe Lane. He agreed to grant the Indians a reservation that included the Table Rocks, and he also promised that the Army would build a fort nearby to protect the Indians from armed vigilantes. An Oregon county was named after Joe Lane, he was elected senator, and he was nominated for Vice President on a ticket that lost to Abraham Lincoln. Geology: The 125-foot-thick andesite rims capping these U-shaped mesas are remnants of a lava flow that snaked down the Rogue River Valley 9.6 million years ago from vents east of Prospect. Since then, erosion has worn away the softer surrounding rock, leaving the hard andesite perched 800 feet above the plain. Why are the mesas U-shaped? Geologists propose that the curves were originally horseshoe bends in the river channel where the lava flowed.